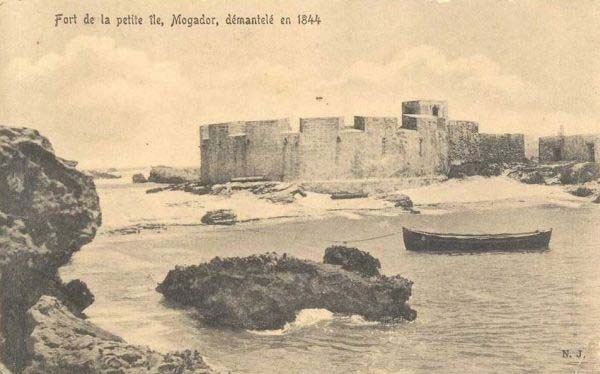 The Mogador Bay is almost closed by the large Island of Mogador, making it a relatively peaceful harbour protected against the strong winds of the area and it has long been considered as one of the best anchorages of the Moroccan coast. Also for access to fresh water. 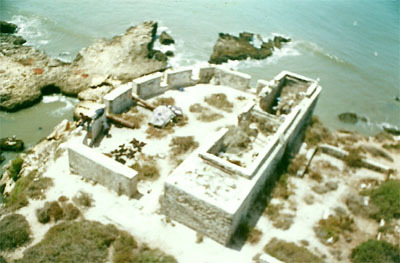 The supply of building-stones and wood facilitated the construction of fortifications. 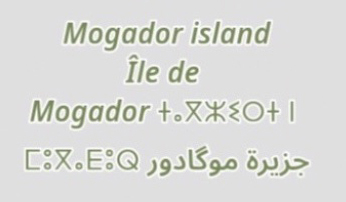 Notice the passage between the Island of Mogador and the mainland. Relief shown by shading. Depths shown by soundings. 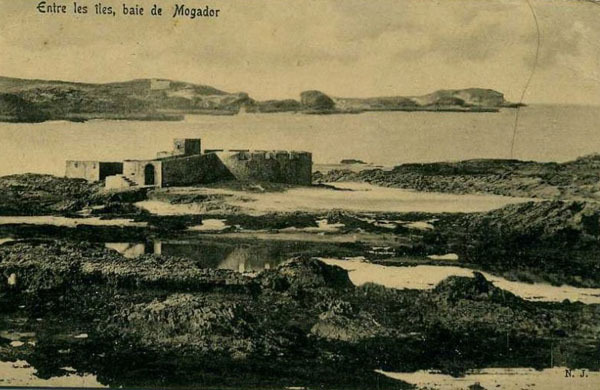 Ile de Mogador , un patrimoine universel à préserver. with the theme Island biodiversity. 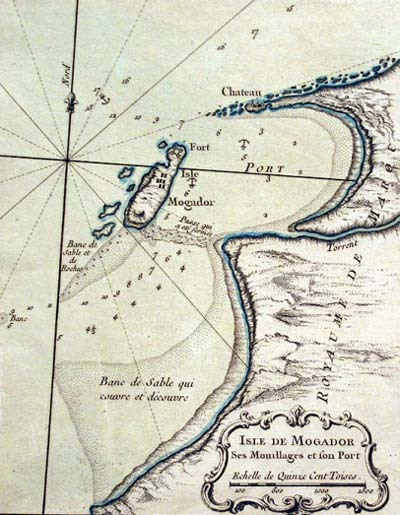 the Island of Mogador, the port with Castelo Real (Chateau) and the new Kasbah Medina. and they named it Migdal , Migdol ("watchtower"). The Romans were interested of the site because of the rich fishing waters and its famous seashell,"Murex" from which a valuable purple dye was produced. The King of Maurtania, Juba II (48BC - AD 23), sent a contingent to "the Purple Island" (Iles Purpuraires) to re-establish the ancient Phoenician dye manufacturing process. Show the map Essaouira Natural bigger. 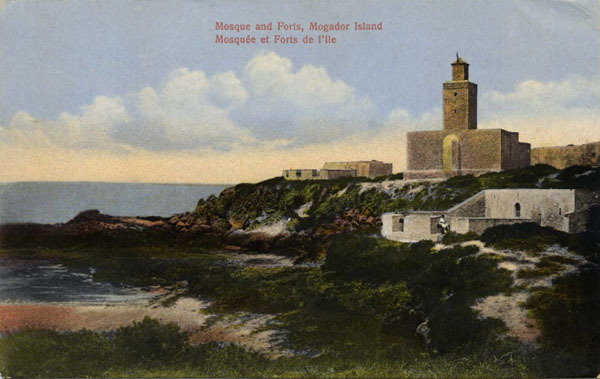 On the island of Mogador was built the Borj El Assa (surveillance bastion). 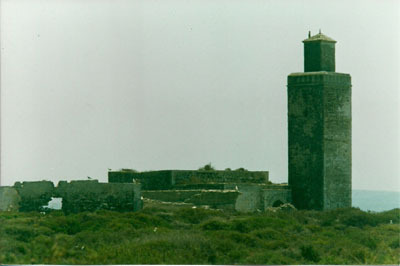 There are six old bastions built in stone on the island. 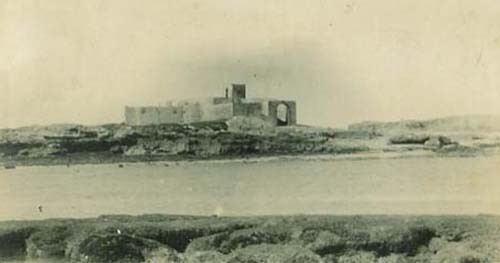 4 late 18th century construction of defensive fortresses constructed by the Sultan Sidi MOhammed ben Abdallah and 2 others by Moulay Abderrahmane. 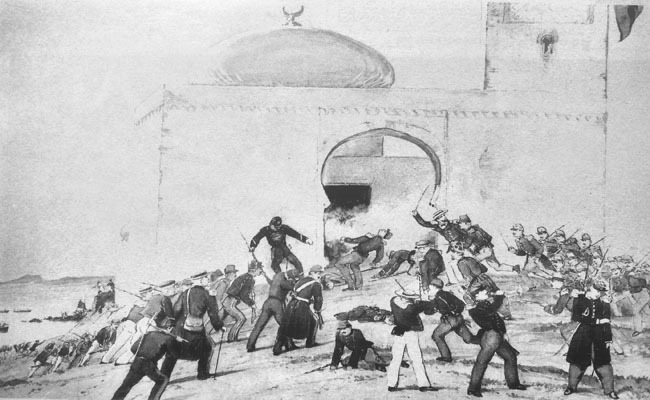 There is also a mosque and a prison which was built in 1897 by order of the Sultan Moulay Abdelaziz to lock up the rebels of Rhamna tribe ( Terhamla tribe) .
" The house of Quarantine" and they used to live ther for 40 days in order to learn about who was sick. Rusty canons in a late stone fortification. 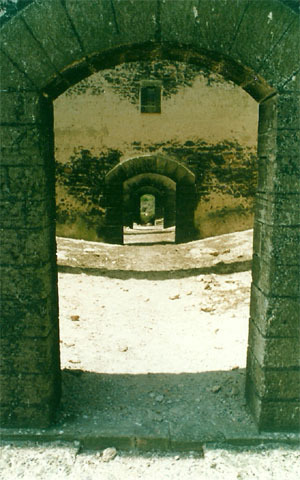 Bastion of the mosque. 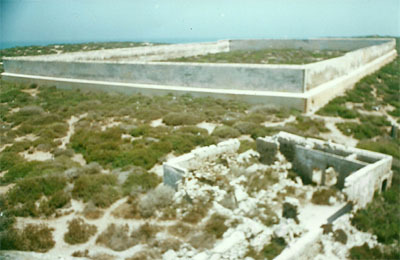 A rectangular wall sufficient high with with only one way in and out. The only entry or exit was through theese doors. Today the island is a nature reserv and has a great bio-ecologigal importance. Eleonora's Falcon on its way to wintering in Madagascar. Returning in April and May. 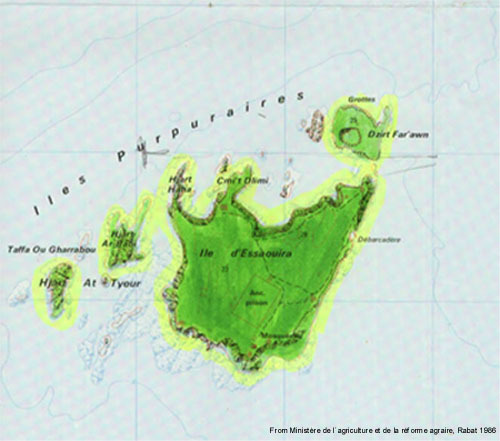 The islands are inhabited and access forbidden to preserve the undisturbed environment for the breeding bird population. There is a conservationist keeping eye of this rare eco system. For birdspotting tours can be made by boat around the islands but entering the islands requires a special permission. 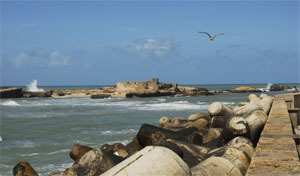 Birds in Essaouira with birdwatching spots. The archeological value of the islands is unmeasurable for learning about prehistoric settlements and the way of life of native populations. Studying the fortifications we learn about ancient methods of construction adapted to the supply of local building materials and natural external conditions. 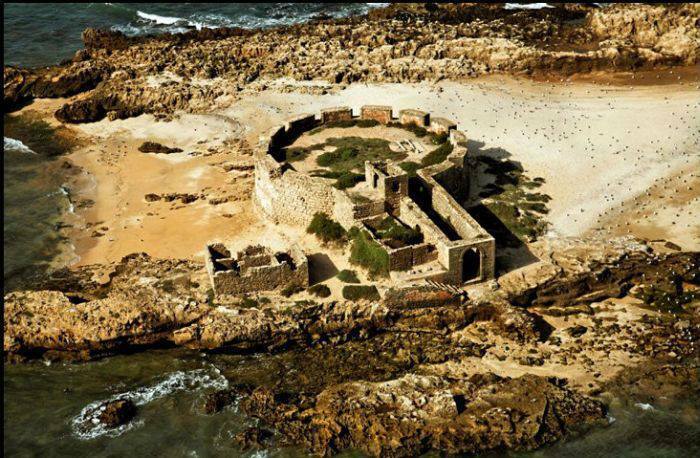 The Phoenician, Romans, Portugeese and the Sultan Sidi Mohammed ben Abdellah - all contributed to make the Island of Mogador a strategic stronghold for defense, trade and for further exploration of Africa and the Americas. 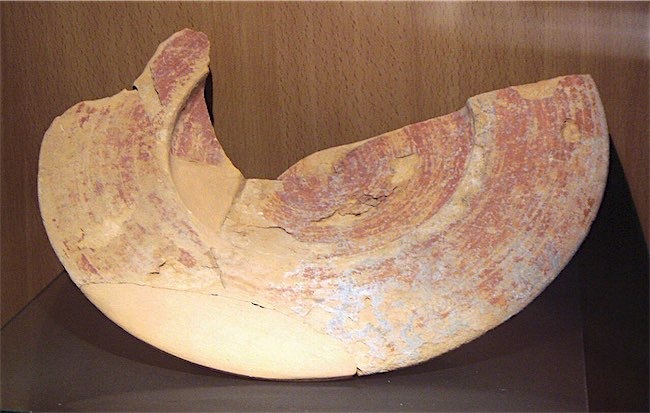 Punic vase found on the island. Amphoras found in the waters between the island of Mogador and the island of Pharaon. 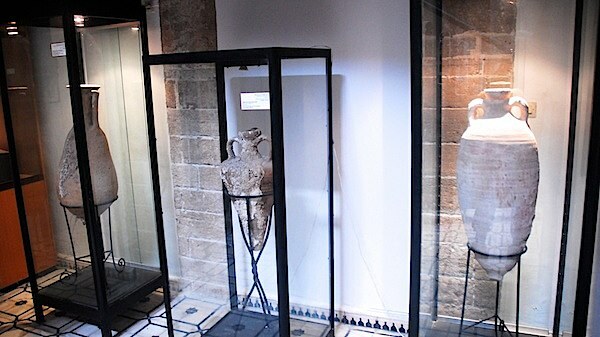 "D'ou la raison et l'importance du programme de recherches archeologiques lance sur ce site par une equipe scientifique maroco-allemande dans le cadre de la cooperation bilaterale dans le domaine culturel qui unit l'Institut national des sciences de l'archeologie et du patrimoine (INSAP) et les departements de l'institut allemand de recherches archeologiques (Deutsches Archaologisches Institut) a Bonn et Madrid.
" 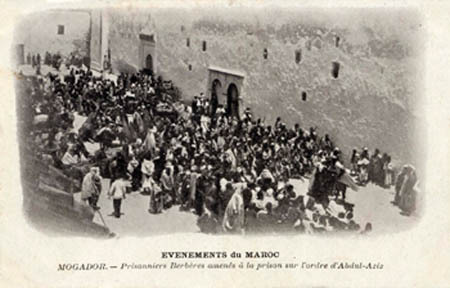 Ce programme a pour objectif principal l'etude de l'Ile de Mogador et les occupations antiques qu'elle a connues, a savoir l'occupation phenicienne datant du 7e ou 6e siecle av.J.C, l'occupation mauritanienne, la phase de Juba II et enfin l'occupation romaine qui s'est achevee vers la fin du 3e siecle apres J.C ", a confie a la Map, M. Mikdad Abdeslem, enseignant chercheur a l'INSAP et co-directeur de ce programme de recherches." In total there are 8 batteries spread over the six islands that face the town.